If you want to enjoy great dining in Branson, don’t miss to visit the 13,000-square-foot Cici’s Pizza restaurant on 76 Country Boulevard. Here you can stuff yourself with Cici’s buffet of pizza, pasta, salad, soup and desserts. With almost 500 locations nationwide, the Texas based Cici’s Pizza had signed a franchise agreement with Fogle Enterprises Inc. in October of 2014 to open a new branch in Branson. Known for its “made-from-scratch dough,” Cici’s Pizza features a wide variety of pizza offering on a budget with family-friendly atmosphere in a large game room area. 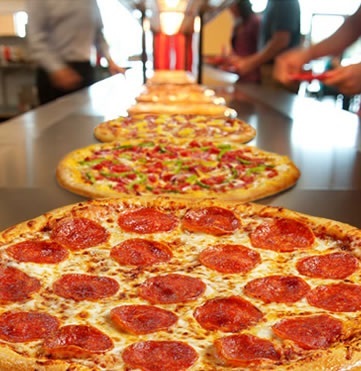 As the largest restaurant in the country, Cici’s Pizza in Branson includes 8,000-square-foot dining area that is capable of seating 391 guests, a separate ready-to-go pizza area, two party rooms for special occasions, and a 5,000-square-foot game room for children of all ages. Franchise owner Nolan Fogle had said about the new location in Branson “What we wanted to do was offer something to our visitors in Branson on the more affordable end of the spectrum.” The value and quality of Cici’s Pizza are the reasons behind in opening the franchise in Branson. The appealing thing about Cici’s Pizza is the amazing value of the incredible quality of food at $6.99 on all you can eat pizza, salad, soup, pasta and dessert buffet. Other franchise locations of Cici’s Pizza have only a small game room, but Fogle and his wife, Babette had ideas of their own making a game room that features 60 games and a large icon out front like the slice of pizza and the Pacman. The game room offers popular games such as Jurassic Park, Fruit Ninja, Dead Storm Pirates, and the typhoon simulator. They also have the classics like ski-ball, and Hot Shot Basketball. According to the couple, the community has responded well to the new restaurant. Pizza and family fun always go together at the new Branson Cici’s Pizza Family Fun Center. Inside and out, the new restaurant and entertainment complex gives more fun to kids and adults alike making imaginative and creative things to do with fun memories. Aside from the million dollar arcade that is packed with games, the restaurant also features two “Birthday Rooms” perfect for special private gatherings. Each room accommodates 25 guests and can be combined to host gathering as large as 50 to 60. Also featured in the restaurants are big screen TV’s throughout the restaurant and party rooms. Cici’s Pizza Family Fun Center lives up to its title where guests will enjoy a buffet of 12 different kinds of pizza at all times, plus a full Salad Bar, Soup and Pasta Bar, and four kinds of desserts. But there’s more on the buffet side, diners can order a custom build Personal Plan Pizzas choosing from over 30 toppings. Beer and wine is also available (but not included in the buffet). The entire restaurant is available for big groups including churches, schools, reunions, companies and more. Dining in Branson can be enjoyed best if you visit Cici’s Pizza on 76 Country Blvd. as the restaurant offers a buffet of pizza, pasta, salad, soup and dessert.